Hand A player's best five cards. 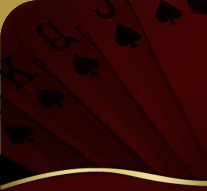 High-Card To decide the first dealer in the flop tournaments each user is dealt a single card and the player with the highest card (based on the card and the suit order - of spades, hearts, diamonds & clubs) becomes the theoretical dealer. Hold 'em Also known as Texas Hold 'em, where the players get two down cards and five community cards. Hole Cards These are the Down Cards in front of the players. House The casino or cardroom that is hosting the poker game.